I can remember my grandmother making oyster stew when I was very young. Though I certainly did not share her enthusiasm for oysters then, I now enjoy them very much. If you would prefer to make a clam chowder, you can easily substitute clams for the oysters. I chose to use the clam base concentrate because it nicely complemented the flavor of the oysters. It is also a stocked item at my grocery store and can be found near the canned broth options. It is very simple to thin a soup—simply add more liquid. If, however, you need to thicken your soup, you can do so by simmering longer without the lid; evaporation eventually will take care of it. For much faster results, try adding a thickening agent like flour, cornstarch, or dried potato flakes. 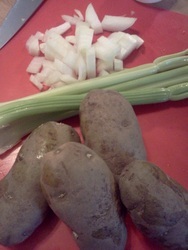 When adding a thickener to the soup, do not add it directly—first remove a little liquid from the soup and in a small bowl create a thick paste; then add that back to the soup, stirring gradually, and then allow that to cook for a few minutes to make certain the dry, floury flavor is cooked out. Nothing quite hits the spot like a nice steamy bowl of soup on a cold, rainy, winter day. Heat olive oil in a large soup pot over medium high heat. 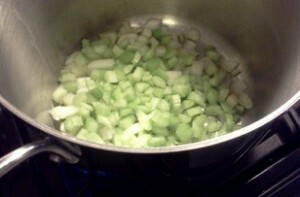 Add onion and celery and sauté until onions start to soften. Add garlic and cook until fragrant. Pour in water and clam base concentrate. Bring to a boil and then turn back heat to simmer, stirring in heavy cream at that time. With a fork, blend together remaining olive oil and flour to form a paste. Whisk into soup and allow soup to cook until it starts to thicken, stirring regularly. Add wine and oysters. Bring back to a simmer and cook for 5 minutes. If soup is too thick you can add more milk to thin. Salt and pepper to taste. Serve with crackers and hot sauce if desired. I garnished mine with fresh celery leaves and Sriracha.